Cleaning the roof gutters or changing the lightbulb can be a pretty difficult task without the help of a telescoping ladder. But not just an ordinary telescoping ladder will do. In order to reach high places without slipping or collapsing, you have to get the best telescoping ladder available. And what can top these five impressive ladders? For our editor’s pick, we chose the WolfWise EN131 Telescoping ladder. Other than its relatively low price, this product is actually famous for its durable design and a great set of features. From its durable materials to its detailed manufacturing, this product is one of the best telescoping ladders in the market! On top of that, it is set at an affordable price. The WolfWise En131 Telescoping ladder can extend up to a height of 12.5 ft. This product is designed with the intention of keeping your fingers safe from accidents and injuries. From fixing your roof to changing a lightbulb, this ladder definitely has your back—or in this case, feet! It is made of sturdy, high quality 6061 Thick Aluminum. This material is also corrosion-resistant. It helps the product last long while being lightweight. It uses a user-friendly independent locking mechanism that allows you to easily adjust each step for the needed height requirement. Because of this locking system, this product collapses into a smaller compact size for storage. It collapses into 34 x 19 x 3.5 inches. With this size, you can store the produce in small spaces like the car trunk or under your bed. It might not feel as stable as you expected. Sometimes, the product gets jammed. Coming down as our runner-up is the Ohuhu Telescopic Ladder. This product is the very definition of quality, performance, and durability. While it may be an alternative, it doesn’t make this product lower in quality than the others! After all, this product is certified by European Safety Standard EN131, CE, and SGS. The Ohuhu Aluminum Telescopic Extension Ladder can reach heights of 12.5 ft while simultaneously having a weight limit of 330 lbs. With your safety in mind, this product has non-slip end caps and strengthening threads to keep your ladder in place. It also makes use of an intelligent locking mechanism that is definitely dependable and easy to use. It is made of a premium aluminum alloy that gives the product its durability and longevity. Its intelligent design and strengthening threads boost the durability and stability of the product. It has several safety measures to prevent any unwanted accidents or injuries. For example, it is designed with an anti-pinch technology and equipped with green and red indicators. These color indicators show if the ladder steps are locked in place. It folds down to a minimal compact size of 100 cm x 44 cm. With this compact size, you can easily store your ladder in small spaces like car trunks, cabinets, or under-the-bed spaces. It might feel too wobbly at times, but this doesn’t mean the product is not stable. It is a bit difficult to lock the ladder in place than other models. Don’t think that if you are a bit low on cash, you won’t be able to get a quality telescoping ladder for home. 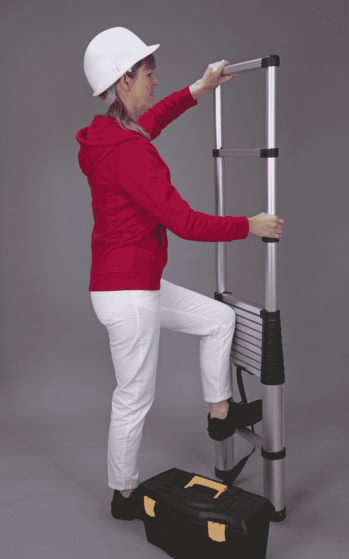 Introducing the OxGord Aluminum Telescoping Ladder, our budget pick! It’s available for a relatively low price without sacrificing its quality. This product is built for durability and safety. The OxGord Aluminum Telescoping Ladder can extend up to 12.5 ft. While it weighs around 24.2 lbs, this product has a weight limit of 250 lbs. Other than its impressive weight limit, this product is up to European safety standards. You can definitely be assured that one step on this ladder will not result in a slippage or fall. It is made of top-grade aluminum. This material enables the product to be in tip-top shape for a long time. It can be tilted up to 75 degrees. With this angle, you can use this product for a lot of purposes—from painting ceilings to on-the-job projects. It easily folds down to a compact size of 3.3 ft. This compact size enables you to store the product in tight spaces. The product is not good for commercial home painting or construction uses. Not as easy to put away after use as the other models. Looking for an upgraded version of our top picks today? Well, we want to introduce you to Xtend & Climb 785P. As our upgrade pick, this product is one heavy-duty ladder. Other than being extra taller and durable, this product has many additional features that earn its title as our upgrade pick. The Xtend & Climb 785P can extend up to a great height of 15.6 ft. Unlike other ladders, this product can certainly help you with the highest and hardest tasks available. It can handle weights up to 250 lbs and ANSI Type I certified. If you want a tough telescoping ladder, then this one is for you! It is made of aerospace-engineered 6061 aluminum alloy. This material makes the product sturdy enough for outdoor and commercial uses. Its double overmolded feet add extra durability and stability to the product. It features an ergonomic design for smooth operation. To ensure the safety of its users, this product features an angled thumb release system. It is built to be easily compacted in a small size for storage. Not only does it have a carrying handle, it also folds down to 35.6 inches. It is bulkier than the other models. For our niche pick, we proudly present the Telesteps 1600EP Telescoping Extension Ladder. This product is one of the safest telescoping products to use! As a company that won the Most Outstanding and Innovative Product Award, Telesteps does not kid around with their telescoping ladders. Extending up to 16 ft., the Telesteps 1600EP Telescoping Extension Ladder can certainly help you around your home. It can withstand weights up to 300 lbs while having an easy weight of 25 lbs. Having a proclivity for safety, this telescope has several safety measures that add durability and stability to the product. It is made of aircraft grade aluminum. This material enables the product to withstand any pressure that a ladder must endure. Its durability has earned its certification of Type 1A. It has earned several safety standards such as SHA Compliant, ANSI 14.2 Tested, AS/NZ, EN-131.6, and TUV GS. It includes a patented one-touch release, adjustable silicone feet, and safety indicators as protections for its users. It collapses to 12.5 ft.;perfect to store inside a vehicle or a truck. It is a bit bouncy. A telescoping ladder has so many uses and functions. 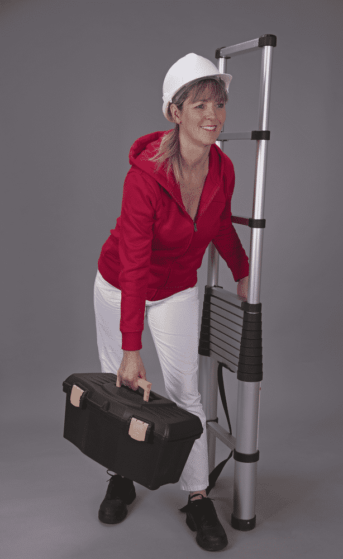 Compared to a regular ladder, a telescoping ladder has added durability, functionality, and portability. Moreover, a telescoping ladder uses up-to-date technology that is designed to be convenient for its users. If you are not that convinced, maybe these advantages will help change your mind. Compared to regular ladders, telescoping ladders can be folded down into a smaller size. Some telescoping ladders can collapse to 27 inches, enabling it to be stored in bedroom spaces, closets, and garages. You may even put telescoping ladders at smaller vehicles during transportation instead of hiring trucks to put your regular ladder. Due to its telescoping technology, the steps can be adjusted to fit any height that the telescoping ladder is capable of. For example, if your telescoping ladder has a reach of up to 16 ft, you can adjust your ladder at any size under 16 ft. Moreover, telescoping ladders have a reliable independent locking mechanism to help you adjust your ladder to your needed height. Telescoping ladders are extremely lightweight if you compare them with regular ladders. Most telescoping ladders are made of high-grade aluminum that is both extremely durable and lightweight. Due to its lightweight and compact nature, you can easily bring a telescoping ladder wherever you go! Most models are equipped with extra straps and carrying handles for this task. The beauty of telescoping ladders is that they are versatile. For any task that a regular ladder can do, a telescoping ladder can do that—plus more! Professional series of telescoping ladders are often used for commercial, construction, or military use. As long as you know how to use one, then you are going to be alright! Due to the durability of its material, telescoping ladders can withstand any kind of pressure put on it. To prolong the longevity of your telescoping ladder, learning how to maintain one is extremely important. Most telescoping ladders pass the stringent safety standards of each country. From the European safety standards to SHA compliance rules, you can be sure telescoping ladders pass those test satisfactorily. If you are working in an environment that requires safety, then telescoping ladders are for you. Even if a telescoping ladder has a certification, it might do good to inspect the ladder before purchasing. You should check if a ladder can handle your weight, works fine, and is easy to use, as advertised. Telescoping ladders will only be advantageous to you if you choose the right one. When purchasing a telescoping ladder, take these purchasing mistakes into consideration. Don’t make the same mistakes as others did! If you are looking into spending for a high-quality telescoping ladder at a lower price, then the WolfWise EN131 Telescoping Ladder is for you. As a WolfWise merchandise, this product is extremely durable, performs excellently, and complies with international safety standards. However, this recommendation does not mean that you are not free to explore other products. After all, these products are part of our top five picks. Each of the products under this list performs excellently as they are described. It is well worth exploring and testing these products for yourself! If you find this article helpful, leave a comment below!